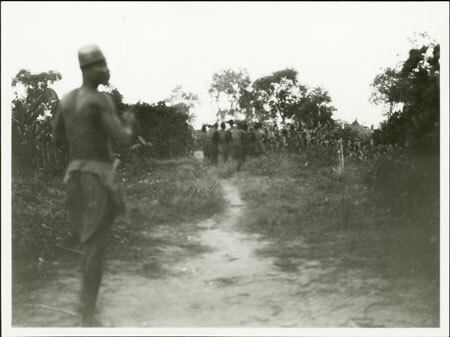 View down a path towards part of a new Government settlement in the bush with a man to the left making his way towards a group of other people gathered near what may be a compound entrance. Morton, Chris. "Resettlement village Zandeland" Southern Sudan Project (in development). 03 Jan. 2006. Pitt Rivers Museum. <http://southernsudan.prm.ox.ac.uk/details/1998.341.335.2/>.